One way of exploring majors and careers is by looking at occupations according to occupational interest. The Strong Interest Inventory is based on these codes and only measures your interests. For example: your SII may indicate an interest in nursing, that does not mean you will pass anatomy! 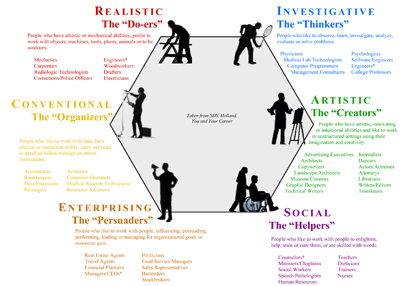 John Holland conducted research that divided jobs and job seekers into six broad categories: Realistic, Investigative, Artistic, Social, Enterprising and Conventional. Your Holland Code is a generalization and may not be an exact fit. However, it might help you discover where you can find occupational satisfaction. Click on a section below to view the different Holland Types, their characteristics and possible career paths. PDF version of this code chart.